On the night of 5 April 1779, Charles Messier recorded Pallas on a star chart he used to track the path of a comet (now known as C/1779 A1 (Bode)) that he observed in the spring of 1779, but apparently assumed it was nothing more than a star. ^ a b c Schmidt, B.E. ; Thomas, P.C. ; Bauer, J.M. ; Li, J.-Y. ; McFadden, L.A.; Parker, J.M. ; Rivkin, A.S.; Russell, C.T. ; Stern, S.A. (2008). "Hubble takes a look at Pallas: Shape, size, and surface" (PDF). 39th Lunar and Planetary Science Conference (Lunar and Planetary Science XXXIX). Held 10–14 March 2008, in League City, Texas. 1391 (1391): 2502. Bibcode:2008LPI....39.2502S. Archived (PDF) from the original on 4 October 2008. Retrieved 24 August 2008. ^ Dorminey, Bruce (10 March 2019). 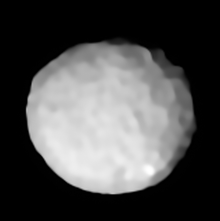 "Proposed NASA SmallSat Mission Could Be First To Visit Pallas, Our Third Largest Asteroid". Forbes. Retrieved 10 March 2019.